Funeral Mass for Captain Marcin will be celebrated Monday, July 24th at St. Matthew's Church in Windham NH. 11 York Road, Windham NH 03087-2305. Charles Marcin, 79 of Windham, N.H., died peacefully Tuesday at his home in Windham. Charlie was born in Lawrence, where he grew up and was educated, graduating from Central Catholic High School. He later attended University of Lowell. He was a resident of Windham for the past 14 years, formerly of Salem, N.H., where he lived for many years raising his family. Charlie was a retired Captain for Delta Airlines, where he worked for 32 years. He started his career as a flight instructor at Lawrence Airport, then he worked for Flying Tigers and Northeast Airlines. Charlie enjoyed watching old war movies, skiing, the lake and beach, and going to the glider-port. Most of all Charlie loved his family and enjoyed watching them play sports. He was also a U.S. Air Force veteran and a member of St. Matthew's Parish in Windham, N.H. He is survived by his beloved wife, Joyce "Bunny" (DeLuca) Marcin of Windham, N.H.; children, Jody and his wife Tonya Marcin of Georgia, Cindy and her wife, Kathy Hunt-Marcin of Windham, N.H., Wendy Marcin of Lawrence, Randy and his wife, Kristin Christensen of Delray Beach, Fla., and Perry and his wife, Stacie Marcin of Pompano Beach, Fla.; grandchildren, Bennett, Hunter, Henson Cooper, Reece, and Rayne; many nieces and nephews. 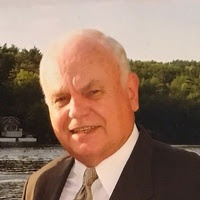 A funeral Mass will be celebrated Monday, July 24th at 10 a.m. at St. Matthew's Church, 2 Searles Rd, Windham, N.H. Burial will follow in Immaculate Conception Cemetery, Lawrence. There are no calling hours. In lieu of flowers, donations may be made to Mass General Hospital-Parkinson's/Movement Disorders Unit. In the memo, please put in memory of Charlie Marcin, Attn: Tricia Keck, 125 Nashua St, Suite 540, Boston, MA 02114, or https://because.massgeneral.org/charliemarcin To send a message of condolence to the family, please view the obituary at www.carrierfuneralhome.com. The Carrier Family Funeral Home, 38 Range Rd, Windham, N.H., has been entrusted with Charlie's arrangements.